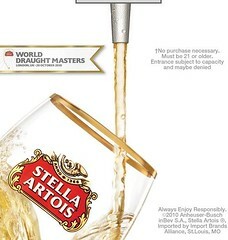 As a fan of "Mad Men", I congratulate Stella Artois for being an average beer with excellent marketing. They've had cool ads in British magazines for years, and they hold this competition for the "special pouring process" in their "special glass". For some reason, Boston is hosting the US champion where someone will be chosen to battle against 31 other skilled beer jockeys next month in London. I like the idea of drinking free beer at the Liberty Hotel. You can either RSVP at the website or send an email with your name, phone number, and the number of people attending. In an unusual turn, I posted about the first Wine Riot in April of last year. To date I've only attended my personal "wine riots", however I liked the idea of trying a lot of good wine for the price of a couple of mid-priced bottles -- in a setting that isn't as crowded as the Boston Wine Expo. While many liquor stores offer free tastings on a regular basis, the Riot organizers are hosting a handful prior to their event in October. 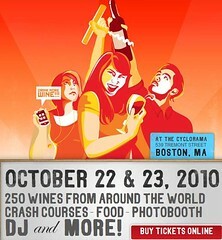 Besides offering samples of a handful of wines, you can buy $5-off discounted tickets (cash only). You don't have to go to the Wine Riot to show up and try some wine. I'd rather that you pay less if you do.